Digiarty Software has replaced WinX HD Video Converter Deluxe with a brand-new and more advanced VideoProc - a 4-in-1 combo of video editor, format converter for DVD/video/audio, media downloader and video recorder. Additionally, minor updates will still be pushed to old users of WinX HD Video Converter Deluxe. Oct.5, 2018 -- Digiarty Software, the world-renowned media software developer, has replaced eight-year-old WinX HD Video Converter Deluxe with a completely-upgraded and more functional VideoProc while maintaining prices at the same level. With thoroughly rebuilt core and UI, VideoProc comes as a 4-in-1 combo of video editor, format converter, media content downloader and video recorder. Despite being substituted, WinX HD Video Converter Deluxe will still be minorly updated. 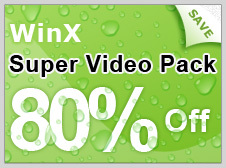 WinX HD Video Converter Deluxe was released on March 16, 2010. Over years, from the initial version to the current 5.15.0, it has been in development for always keeping pace with latest technology trends, such as the supports for 4K/8K UHD videos, HEVC codec and GPU acceleration. The rebuilt version, VideoProc will be a qualitative change, not only in form but also in content. "It is the strongest 4K video processing software designed to edit, cut, crop, merge, adjust, convert and compress large videos with full Hardware Acceleration powered by Intel, NVIDA and AMD," commented proudly by Jack Han, CEO of Digiarty Software, "In a word, VideoProc will be the most streamlined and complete program so far in our history. So that our users will no longer need to install a pile of programs to perform different video processing tasks." Above all, the successor will be the incomparable beginner-level linear video editing software from today on. It is providing the most streamlined video processing performance even towards oversized videos created by GoPro, DJI, VR video cameras, dashcam, 4K cameras and smartphones. In addition to the basic and useful video editing features like cutting, splitting, trimming, merging and rotating, it is GoPro oriented so as to stabilize shaky footages, reduce wind noises, rotate / flip videos, fix lens distortion, and add artistic filters and so on. For movie lovers, it cannot be easier to burn in subtitles, add watermark, and convert 3D to 2D. For SNS enthusiasts, making GIFs from videos or capturing video snapshots is just one click away. In parallel, VideoProc is a video transcoder, audio format switcher and DVD converter. It holds true for nearly all media formats, such as for converting MKV to MP4, H264 to HEVC (H265), MP4 to MP3, AVC to FLAC, DVD to MP4 and DVD to ISO image file. Having 420+ ready-made profiles, it converts videos directly to fit iPhone, iPad, Android devices, Xbox, YouTube, etc., and allows users to customize video resolutions, bit rate, frame rate or activate 2-pass encoding, GOP, B-frames and so on for desired video audio quality, file size and compression level. Based on video audio downloading function in the previous version, the new comer additionally supports download live videos, playlist and channel, as many as 1000+ online UGC sites supported. The video processing software also allows users to preset time for live video recording, add videos to Watch Later Playlist for batch downloads, search and download subtitles of movies or TV series online, and use proxy server to download and enjoy media contents anywhere. • State-of-the-art technologies: It maximizes the processing speed and optimizes output quality and file size by Level-3 hardware acceleration, SAO, I-P-B Frames (Inter-frame Compression + Intra-frame Compression), Entropy Encoding and Hybrid Encoding, etc. • Superfast Auto Copy: Possibly convert video/audio formats in just 1 second without re-encoding. For example, you can convert MKV to MP4 or iPhone at over 1000 FPS without quality loss. • 90% compression ratio: The world's cutting-edge video compression algorithm helps compress a video by over 90% in file size with only pixel-level quality difference. VideoProc, a combination of video editor, converter, downloader and recorder, is available to download now. For old users: upgrade to VideoProc directly from prior WinX HD Video Converter Deluxe version. With 12 years of development, Digiarty has become a world-leading provider of personal and home-use video audio applications based on Windows and macOS. It offers easy-to-use free DVD ripper, DVD copy and burning software, 4K/HD video converter, video compressor, video editor, online video downloader, screen/webcam recorder, media player, iPhone file manager and so on for movie/music addicts, handset owners, game players, etc.